KUCHING – Railings have been installed at Jalan Rock, the location where Herman Sihas and Kho Ying Qi were dragged by strong floods this month. 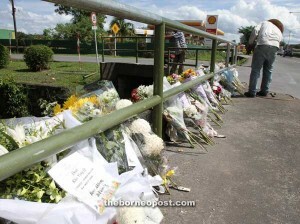 The location still has a row of flowers placed by Kuching residents as a sign of sympathy for both victims. The railings are expected to help avoid such incidents in the future. The body of Herman has been found, but rescue workers are still looking for Kho who has yet to be found. The search has since been widen to cover the areas near the sea. Previous articleMatch Preview: Sabah Expected To Overcome Sarawak? My goodness!!! Is Sarawak so poor as not to be able to afford railings around storm drains????? Flood or not, railings are essential around huge drains! Why must people/taxpayers lose his/her life first before the relevant authority decide to do something that they should have done ages ago????!!!! !